Terrific Trio Workshops provide intense field and image processing experiences for those wanting to expand their photographic vision and technique. Bruce Hucko teams with friends in photography Guy Tal, Colleen Miniuk, Michael Gordon, Steve Traudt, Jeff Foott, Judith Zimmerman, Chuck Kimmerle and others to bring you a dynamic workshop set in the Moab area. Currently Offering: Terrific Trio 2019 with Guy Tal and Michael Gordon. Our workshop information will be available soon. The workshop will be based at Moab Valley Inn. Five nights lodging is part of the fee. $2200 (based on double occupancy). $2450 for single. April 29 (Monday) - May 3 (Friday). Lodging begins Sunday evening and ends on Friday at 4 PM with the option of staying Friday night. 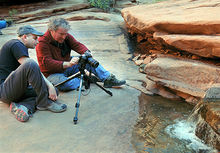 Please visit the Moab Photography Symposium website to read about it and register. There are currently no other Terrific Trio Workshops scheduled. Check in again please.